Crystal Palace produced a spirited display to earn a point from a lively encounter at the Liberty Stadium. 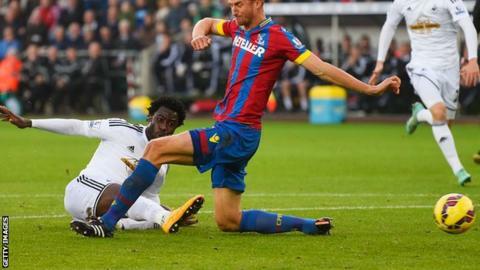 Swansea dominated the early exchanges and went ahead when Wilfried Bony shot on the turn into the bottom corner for his sixth goal in the last seven games. But Jonjo Shelvey felled Marouane Chamakh and Mile Jedinak converted from the spot to equalise for Palace. There were fewer chances after the break, Gylfi Sigurdsson twice firing off target from the edge of the area. After the euphoria of last week's impressive victory against Liverpool, it was another solid performance from Neil Warnock's Palace, who might have been swept aside within the opening quarter. Swansea began in irresistible fashion, Jefferson Montero and Wayne Routledge causing havoc on the flanks and Sigurdsson linking skilfully with Bony through the middle. Bony, who had already twice gone close after flowing team moves, collected Sigurdsson's disguised pass just inside the area and fired in acrobatically from close to the turf. Ironically, Palace improved after striker Dwight Gayle went off injured, as his replacement James McArthur brought much needed extra presence to the midfield. The visitors had been reduced to the occasional foray from the pacy Yannick Bolasie but it was one of those bursts that led to a brace of corners, the second of which resulted in the penalty. Shelvey was adjudged to have backed into Chamakh and Jedinak hit the spot kick down the middle to send Lukasz Fabianski the wrong way. The equaliser revitalised Palace and they might have taken the lead when Ashley Williams missed his kick to allow Chamakh a clear sight of goal eight yards out, but Fabianski was alert to rush out and smother the shot. Swansea fans were convinced Chamakh, who had been booked for a scything challenge on the touchline, should have been dismissed for a handball on the edge of the box. And Shelvey should have atoned for his earlier misdemeanour shortly before the break, firing wide when unmarked in space eight yards out. After the break Swansea's creative players were unable to exert as much influence on proceedings as Palace's well-marshalled defence ensured further progress, the Eagles climbing to 14th in a congested mid-table. Swansea manager Garry Monk: "Apart from 10 minutes in the first half we controlled the whole game. We had our chances but couldn't get the second goal and it became difficult. "We were the better team by far but you have to put the ball in the net. "It was difficult when they were basically camped out on their 18 yard box, but credit to them - they defended well." [On the Palace penalty] "The referee signalled it was a taking away of the legs but it seemed inconclusive to me." Crystal Palace boss Neil Warnock: "After a terrible start, as bad as I have seen us play in the first 15 minutes, we regrouped and I thought we always looked a threat. "I thought there were opportunities to win the game. [On Palace's penalty] "I thought it was a penalty, he stops him from getting the ball. They're a good group of lads, they work hard, we're limited but it's great the lads are doing what they're doing. "It's a great point and the fans were brilliant again. Points in the Premier League are so hard to gather, and when you come to Swansea, nothing is easy here." Match ends, Swansea City 1, Crystal Palace 1. Second Half ends, Swansea City 1, Crystal Palace 1. Attempt missed. Yannick Bolasie (Crystal Palace) right footed shot from outside the box is too high. Assisted by James McArthur. Attempt saved. Martin Kelly (Crystal Palace) right footed shot from outside the box is saved in the top right corner. Assisted by Yannick Bolasie. Attempt missed. Bafétimbi Gomis (Swansea City) header from the left side of the six yard box is high and wide to the left. Assisted by Modou Barrow with a cross. Corner, Crystal Palace. Conceded by Modou Barrow. Attempt missed. Gylfi Sigurdsson (Swansea City) right footed shot from outside the box is too high. Assisted by Angel Rangel. Substitution, Crystal Palace. Wilfried Zaha replaces Jason Puncheon. Attempt missed. Gylfi Sigurdsson (Swansea City) left footed shot from outside the box is close, but misses to the right. Assisted by Angel Rangel. Attempt missed. Fraizer Campbell (Crystal Palace) left footed shot from outside the box is close, but misses to the right. Assisted by Joe Ledley. Attempt blocked. Gylfi Sigurdsson (Swansea City) left footed shot from outside the box is blocked. Assisted by Modou Barrow. Attempt missed. Yannick Bolasie (Crystal Palace) right footed shot from outside the box misses to the right. Assisted by Fraizer Campbell with a headed pass. Attempt missed. Jonjo Shelvey (Swansea City) left footed shot from outside the box misses to the right. Assisted by Ashley Williams following a set piece situation. Neil Taylor (Swansea City) wins a free kick in the attacking half. Substitution, Crystal Palace. Fraizer Campbell replaces Marouane Chamakh. Offside, Crystal Palace. Scott Dann tries a through ball, but Marouane Chamakh is caught offside. Attempt missed. Jefferson Montero (Swansea City) left footed shot from outside the box misses to the right. Assisted by Ki Sung-Yueng. Attempt saved. Gylfi Sigurdsson (Swansea City) right footed shot from outside the box is saved in the centre of the goal. Attempt saved. Jonjo Shelvey (Swansea City) right footed shot from the centre of the box is saved in the centre of the goal. Assisted by Wayne Routledge with a cross. Attempt blocked. Yannick Bolasie (Crystal Palace) right footed shot from the right side of the box is blocked. Assisted by Mile Jedinak. Attempt saved. Mile Jedinak (Crystal Palace) right footed shot from outside the box is saved in the centre of the goal. Corner, Swansea City. Conceded by Martin Kelly.